One of the best ways for skilled workers to move to Canada is by applying through the Express Entry Profile Program. In order to apply under this system you first need to create a profile. But there are chances that you make mistakes while applying under the system. But do not worry! There are ways and means to rectify the same. Before we understand how to rectify the mistakes here are some basic things about the Express entry profile. This system basically aims at ensuring that those skilled workers are invited into Canada who can make a contribution towards the economic development of the country. The applicant first needs to create a profile which tells about his skills and experience. The selected candidates will then get an invitation to apply for the PR visa. It should be noted that there are several benefits of Canada PR visa like one can live, work and study anywhere in Canada and also one can get a number of social and medical benefits. But while creating the profile and submitting the application there are chances that you may make a mistake. Here’s how you can fix them. Here’s when you can make the changes! If you have not received an invitation to apply for a permanent residency visa, then you can easily make the desired changes to your profile. Here are the steps that you need to follow in order to make the changes! Click on Save and Exit. This step is really very important. When you cannot make the changes? If your profile has been rejected as it is not eligible then you cannot make any changes to the existing profile. But that does not mean that your dream to migrate to Canada is shattered. You simply need to create a new profile and make a new beginning. In order to avoid mistakes, hire an expert! We are human beings and there are times when we might make an error while filling up the form. In order to avoid this you can seek the advice of expert visa agents like us. We at Kansas Overseas Careers have the best team of immigration experts who will be able to guide you with all the procedures for submitting the application for PR visa. We will explain to you how exactly you must fill up the application form. We will tell you about the common mistakes that people normally make while filling up the form and submitting the application and how exactly you can avoid this. 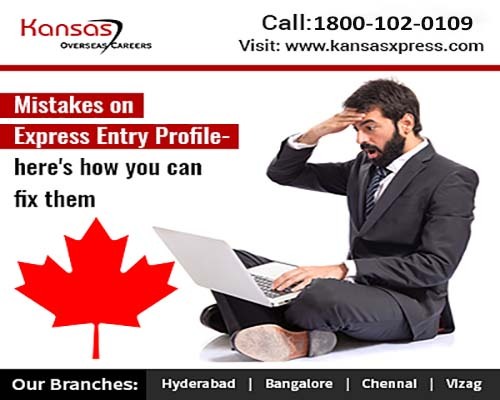 So, if you want to apply under the express entry profile system but are not aware about the procedure then get in touch with us.